Keep safe this winter with our wintry driving tips. Remember it may not only be your life you are risking but those of others too. Listen to the advice from police and unless it is absolutely necessary – stay put. Winter is not the time to run out of fuel so make sure that you keep your tank topped up. Try not to let it get below the halfway mark so that you have always got enough fuel to get somewhere warm and dry. Keep an eye on your lights, the coolant level and your wipers. These are not a particularly difficult chore but all of these things are vital when you are ploughing through snow or storms. Before you set off allow yourself a good 10 minutes to clear the car. Defrost the windscreen completely and make sure you can see out of the rear window. 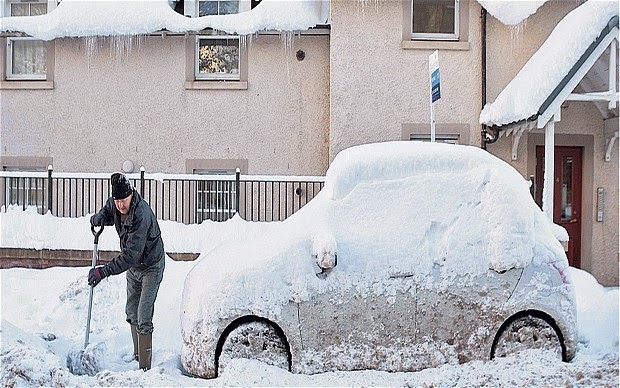 Clear the side windows and the mirrors and by the time you have done this, the car will be warm and cosy inside. Whether it is driving rain or snow, or ice on the road, the extra seconds’ will five gain you more stopping room and help avoid an accident. Forget the two second rule and think four or five seconds at least behind the car in front. It may seem a simple piece of advice – but drive slowly. Treacherous conditions mean that the unexpected may be lurking just around the corner so take it slow, or stop completely if need be. Ice, snowdrifts and deep puddles are the types of hazards you can expect. Don’t forget to store emergency numbers on your phone! Also know where you can get help if you get stuck, or if the car breaks down. Spending a night in the car in freezing temperatures is not much fun. Winter is not the time to impress your friends with your knowledge of shortcuts. Stick to busy roads where there will be other people around should you need help. In snowy conditions, major roads are gritted first and if you are on some lonely country road chances are you might not have mobile signal either. If you are driving somewhere you have never been before have a good look on the internet for directions, log the address into your Sat Nav or phone and as a backup, keep a map in the glove compartment. It may be old technology but for a couple of pounds it could get you to your destination. You should have a hazard warning triangle but a spade, torch, blanket, boots and jump leads are all the kind of things you should be carrying in winter weather. Sand or salt are useful too if the weather really sets in and you are going far. It sounds like a lot, but you will count your blessings should the worst happen. Get a quick quote on your breakdown cover with Discount Insurance now!